Maruti Suzuki has launched the Baleno hatchback in India at Rs 4.99 lakh (ex-Delhi, for the Sigma petrol). The Baleno is a premium hatchback from Maruti Suzuki which is set to compete with the likes of Hyundai Elite i20 and Honda Jazz. Under the hood, it gets the same 1.2-litre K series petrol engine and a 1.3-litre DDiS DOHC engine as the Maruti Swift. The petrol engine produces 84PS/115Nm with a claimed fuel efficiency of 21.4kmpl. It is mated to a 5-speed manual transmission with an option of a CVT only in the Delta trim. The diesel engine on the other hand produces 75PS/190Nm with a claimed fuel efficiency of 27.39kmpl, the highest in the segment. It gets a 5-speed manual transmission with no automatic gearbox, even as an option. The engine as of now doesn't come with the SHVS tech. The car is built on an all-new platform and will be exclusively manufactured in India and exported to over 100 countries. We expected the Maruti Baleno to get the 1.3-litre SHVS diesel engine with 90PS of power. This would have set it in par with its competitors in term of power delivery. However, the car is 300kg lighter than the Hyundai Elite i20, giving the Baleno an advantage in the power to weight ratio. 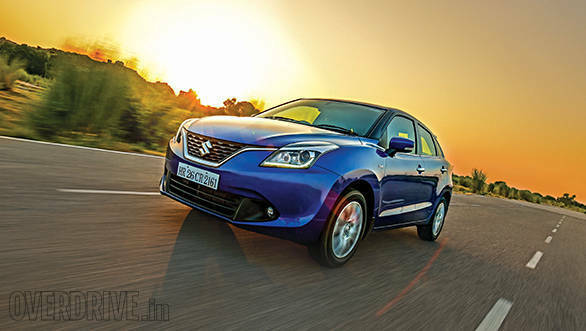 Our drive too confirmed that the Maruti Baleno diesel is a peppy performer.